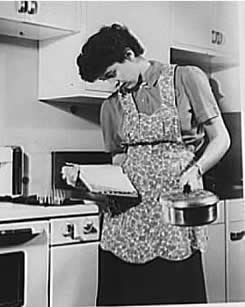 We thought this was just a picture of a hot 40s HOUSEWIFE reading a COOKBOOK and trying not to drop her pan. BUT NO. It turns out "this photo (1942) was used by the Office of War Information to show how to conserve gas. The cook is wasting gas by reading a recipe while the burner is on." WHO KNEW? Glam Books--now with Education! How to conserve household gas. There's a time for everything, and the time to read a cookbook is before you light the gas, not after. Burners should not be lit until the cooking utensil is ready for the flame. Whenever possible, use low heat; whenever practical, use direct heat rather than a double boiler.